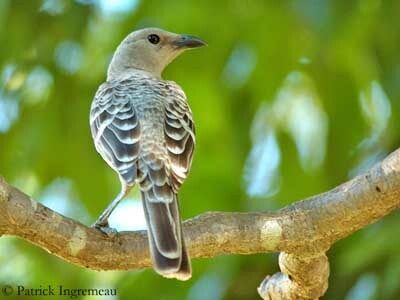 The Great Bowerbird is one of the five grey bowerbirds of the genus Chlamydera, and the largest species of this family. Its spectacular displays close to the bower are conspicuous, and the male spends most of the year working and defending this place. The adult male has brownish-grey plumage overall with darker upperparts. Mantle, upperwing, uppertail-coverts and tail are dark brown with conspicuous whitish edges and tips. On the underparts, chin, throat and upper breast can be slightly darker and greyer. The undertail-coverts are paler brownish-grey and barred by several darker bars. On the head, the crown is greyer. The lores are darker and browner. The head can be finely spotted with silver and darker colours. On the nape, we can see an erectile filamentous pale pinkish-mauve crest, bordered with fine brown, white-tipped short feathers. This patch is usually visible only during the displays. The strong bill is blackish. The eyes are dark brown. The powerful legs and feet are olive-brown. The female has similar plumage, but she has smaller crest or lacks it. She is smaller than the male. 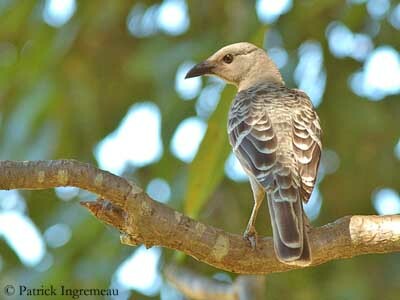 The juvenile has conspicuously spotted pale buff upperparts. The immature male lacks the crest. It has dark throat and heavily barred and mottled brown-grey breast. C.n. orientalis is smaller than nominate. The upperparts are more contrasted darker brown and whitish. 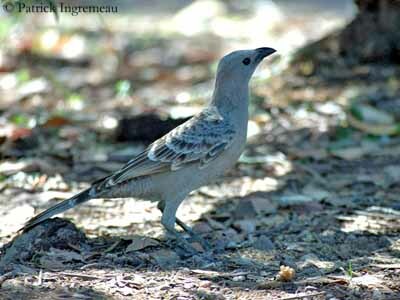 The Great Bowerbird utters loud, harsh notes and also explosive hissing, cackling and chattering. 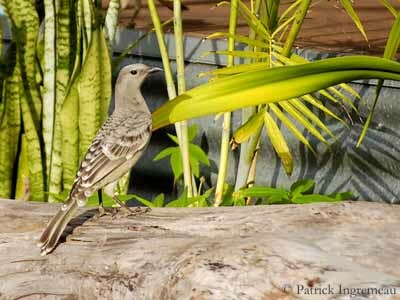 Its calls include some mimicry of other birds’ species and also human-made noises. These calls are given from usual perches such as treetops at 6-8 metres above the ground, and between 30 and 200 metres from the bower, but closer during the displays. The advertising song by the male includes the same type of sounds. Both male and female perform mimicry of predatory birds. The male gives them at the bower, whereas the female does it at nest if threatened or disturbed. 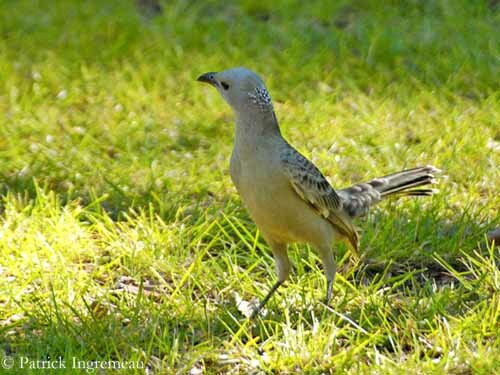 The Great Bowerbird frequents rainforest edges, drier Eucalypt forests and riverine woodlands, mangroves, but also suburbs and gardens. This species is usually found close to the water, and is visible from sea-level up to 600 metres of elevation. 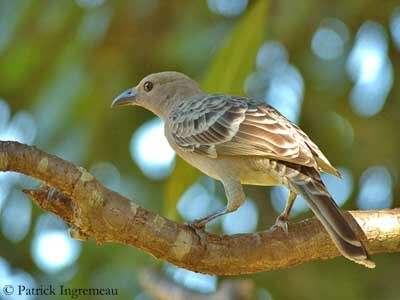 The Great Bowerbird is resident in NW Australia, including several offshore islands, to N Northern Territory and extreme NW Queensland (race nuchalis). The race orientalis occurs in Queensland, except the extreme NW. 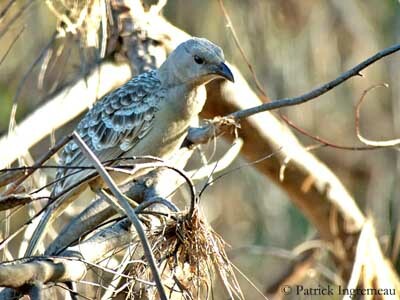 The Great Bowerbird feeds on plant matter and insects. It consumes fruits, flowers, nectar, green vegetables and seeds. It catches insects and the chicks are fed mainly with grasshoppers. It feeds on figs (Ficus) and can also take food scraps. The male stores fruits at bower site for later consumption. This species forages in trees such as fruiting trees, in shrubs and on the ground. 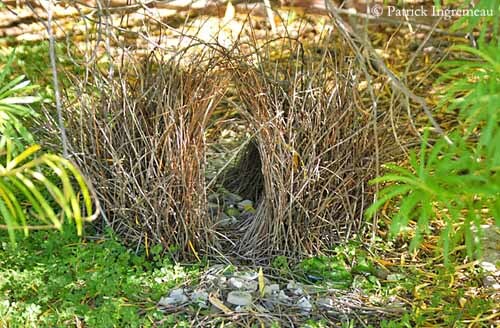 But the Great Bowerbird is mainly known for its conspicuous bower used to attract females. The bower is built beneath bushes with a shading canopy, often close to protective vegetation and adjacent to open areas. The bower can even take place on top of buildings. 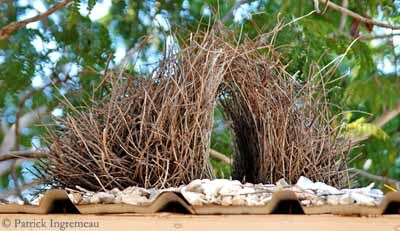 The male builds its bower, a large structure of 54 to 60 cm long, about 50 cm wide and 37 cm high externally. The “avenue” (or central path) is about 14-15 cm wide, and the alignment it typically N-S or very close. There are two parallel walls made with interwoven sticks. A wide variety of objects decorate the bower. They are placed at each avenue entrance and include white or grey snail shells and mammal bones, but also green fruits and leaves, some red items and numerous other objects. The male attracts the female by series of calls, including mimicry of other birds and machinery. Once the female seems to be attracted, the male starts to display and perform strutting walk or run around the bower, it adopts various postures such as upright, forward-stretch and crest display. These displays are performed at each entrance. They are series of exaggerated and contorted displays. During the displays, the silent female crouches motionless within the avenue while the male darts rapidly towards her and moves back again, picking up some items which it shakes aggressively with the bill. The copulation takes place inside the bower. The male is polygamous and breeds with several females. It may reuse the bower year after year. The Great Bowerbird performs characteristic undulating flight. 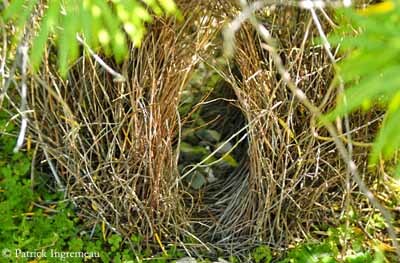 The Great Bowerbird breeds all year round throughout the range except in April and June, with egg-laying peak in October/November. After the displays at bower and the copulation, the female builds the nest to lay her eggs. This nest is a loose cup. The structure is made with slender sticks and twigs. The cup is lined with finer twigs and some leaves. It is placed between 2 and 9 metres above the ground in tree or bush. The nest-site can be reused. She lays one or two eggs, and incubates alone during three weeks. She broods the chicks after hatching during the two first weeks, and feeds them with large grasshoppers. They fledge at about three weeks of age. In nest defence, the female performs mimicry of predators’ calls, and can also use distraction display, and chase the intruder away from the nest-site. 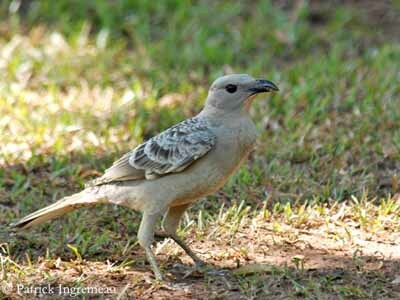 The Great Bowerbird feeds on fruits, flowers, green vegetables, nectar, seeds, insects and food scraps. It forages in fruiting trees, bushes and on the ground. 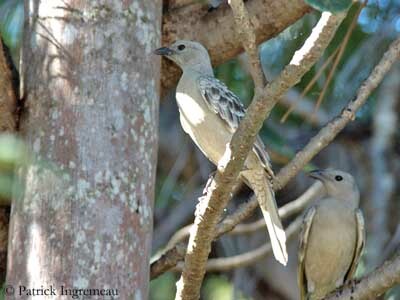 The Great Bowerbird is locally common to fairly common. This bird can damage fruit and green vegetable crops when they occur in flocks in winter. They can be killed by humans for this reason. But the species is not currently threatened.